Professional upholstery cleaning Irvine, CA. Drier. Cleaner. Healthier® Call (949) 612-7464 to schedule an appointment or fill out our online form. Furniture serves many purposes in a home. Furniture is primarily for seating but it can be for storage too. From a decorating standpoint, furniture tends to be a focal point and it can be modern or classic depending the ambiance. No matter the purpose, all furniture and all upholstery will get dirt and needs regular upholstery cleaning from professionals. Your sectional, recliner, love seat, couch and other upholstered furniture should be cleaned once every 12-18 months. Seat cushions too! And don’t forget about your car. You can prevent dirt to an extent by limiting the amount of food you eat on your furniture. You can also restrict pets from being on furniture too. But even furniture that appears clean still needs to be cleaned regularly. Some oils and dirt are embedded in the upholstery unseen to the human eye. If left alone, eventually the surface will appear worn and discolored and effects will be permanent. Active Chem-Dry removes surface dirt and embedded dirt for a complete clean. After our upholstery cleaning service your furniture will look as good as new. 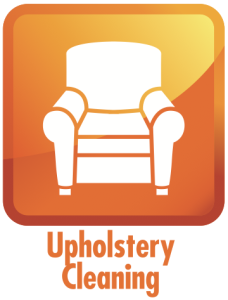 Our technicians have training and experience in upholstery cleaning in Orange County, CA. We can remove liquid stains, pet stains and more! Active Chem-Dry upholstery cleaning isn’t too different from our carpet cleaning process. We use the same solutions and the same concepts for the same great results. We don’t use any soap to clean your furniture. We use The Natural®. The Natural cleaning solution relies on millions of effervescent bubbles to lift oils, soils and dirt to the surface of the upholstery. The carbonated bubbles are so strong they can even lift pet hair! The Natural penetrates deep into the upholstery fibers to remove unseen dirt. We then use our proprietary Hot Carbonated Extraction (HCE) system to permanently remove the dirt. Carbonated cleaning requires very little water and our upholstery cleaning process requires no soap whatsoever. The Natural and our solutions are green-certified so our process is safe for children and pets. Once your furniture is dry it is completely safe to use again. In addition to our standard upholstery cleaning service, Active Chem-Dry offers a Protector Shield solution that creates a barrier against liquids to help prevent spills from permeating. Call (949) 612-7464 to learn more about our stain protector solutions. Restores manufacturer stain guards for additional protection. Repels stains to allow time to react. Compatible with most furniture materials. Safe for delicate upholstery fibers. 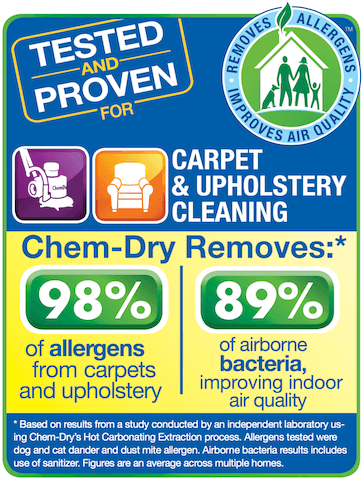 Allergy and asthma sufferers can ensure healthier air quality in their home when they choose Chem-Dry for upholstery cleaning. According to our recent Home Health Study, the Chem-Dry upholstery cleaning process removes 98% of allergens* from upholstery and carpet. Upholstered furniture essentially acts as a larger filter, storing the allergens, particles and contaminants that float onto its surface. While it’s better for those allergens to be in your furniture than in the air you are breathing, you will ultimately still want them removed from your home. Upholstery acts as a filter that stores allergens and contaminants from the air circulating in your home. You don’t want to breathe in those allergens and you don’t want them in your furniture. Active Chem-Dry can remove them. Call us today at (949) 612-7464 o schedule an appointment.